Time for another DLC pack to hit the XBOX LIVE Marketplace for Forza Motorsport 3 - The Summer Velocity Pack. "....The Summer Velocity pack makes a splash this month with a mix of track cars, SUV’s, exotics and production cars. This month brings 10 vehicles from different facets of car culture to Forza 3. This month’s 10 cars range from the ultra powerful BMW X6M SUV to the rare, expensive and elusive Bertone Mantide. Track fan favorite Lotus brings the Evora Type 124 to Forza and Peugeot shows us that concept cars can make it past the showroom floor with the very unique looking RCZ. 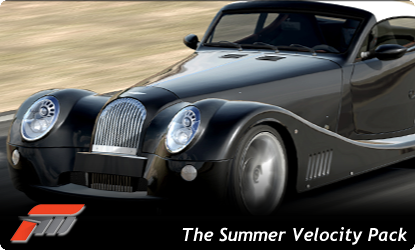 The Summer Velocity car pack is available June 8th for 400 Microsoft points. Be sure to click on the thumbnails below to access the vehicle data sheets on each car available in the Summer Velocity Pack. Each sheet has in-game photos of the cars and a lot of car specs which should give you a good idea on where you can take these vehicles once you pick up the pack. Available June 8th on the Xbox LIVE Marketplace......."